I have a really nice little vase and on looking it up (via Google) I came across a series of posts headed '431 Santa mug and 432 toby jug INQUEST'. I can see from the comments how much confusion there is over dots and numbers and who made what where. Nice to know it isn't just me! I have read about Vic Lawson which helped to a point. 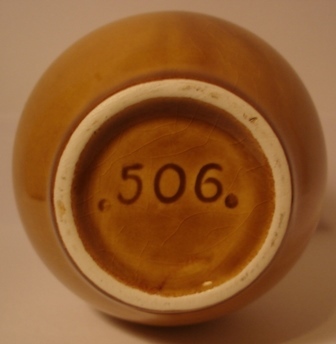 'A Crown Lynn .506. is not a vase like mine at all but one of the long trough type pieces that Crown Lynn made. 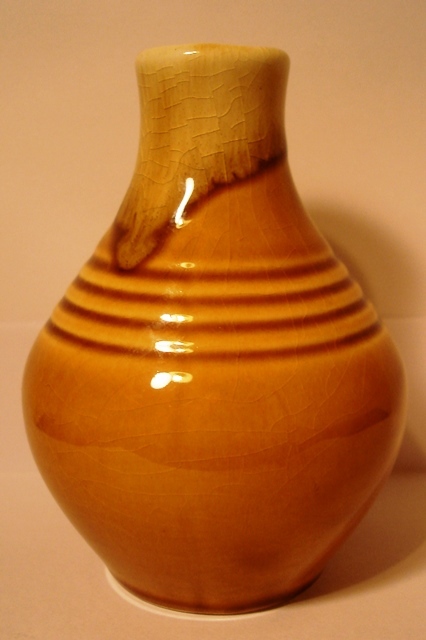 Sorry can't locate a photo but mine is a bit like a miniature bottle kiln with four grooves as the shape reduces to the neck'. That describes my vase perfectly, as per photos. I couldn't find it anywhere else on the site, so apologies if it is here already. This little vase is Titian and you can find it in the Titian Gallery as 506. There has been a lot of discussion about these over the years, but now that we have confirmation from the Crown Lynn records that these were originally Titian when they took them over. Crown Lynn carried on making some of these vases, but gave them 4 digits. Thanks Ev, I was fairly confident too because of their being three digits (I'm Learning!). Thanks for the eHive link; lots of detailed information.